Alexander McQueen, as always, sure pushes the envelope. Alexander McQueen Spring 2010 collection looks as if they are straight out of a sci-fi movie. Extraordinaire! 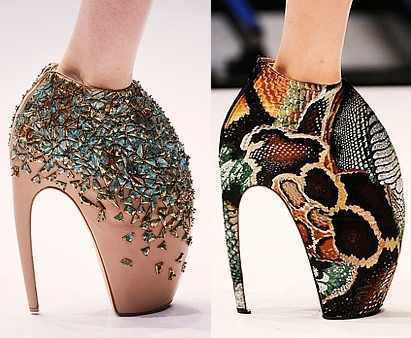 The most intriguing shoes are these super high booties… these make Christian Siriano 2010 shoes look a bit tame. I can’t help but think of… LOL! There is some delicious Alexander Mcqueen fashion on sale right now at Gilt Groupe, luxury fashion up to 70% off!